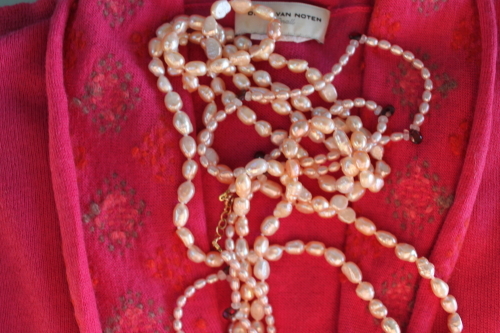 Pink Cardigan: Although I do have a few pink items in my wardrobe I am not a natural-born worshiper of all things pink. It wasn’t therefore the colour that drew me to this Dries Van Noten cardigan but rather the embroidery and I also liked that it is possible to button it in various ways (there are buttons on the inside as well as the outside) for an ever so slightly different look. I have had it for a long time (I am guessing since 2003 as I know I had it before I moved in 2004) and have worn it lots so on cost per basis it was a very good buy. Pink Paper: I buy the Financial Times on a Saturday not for updates on the ever-deepening global economic crisis but because I love the different sections and magazines that are part and parcel of the FT weekend edition. I especially like reading Vanessa Friedman’s take on fashion, Jancis Robinson’s take on wine and Susie Boyt’s take on life’s many glorious and inglorious facets. Just in case you didn’t know the FT (established in 1888) has been printed on salmon pink paper since 1893; according to the FT website this was to distinguish it from its then rival the Financial News. 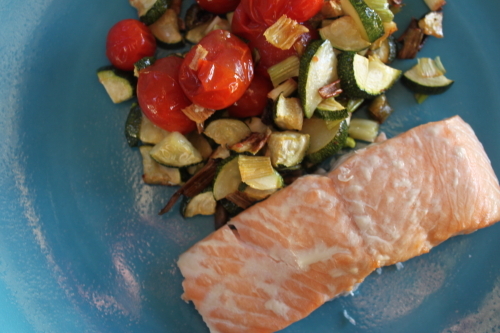 Pink Fish: I am now convinced, by many articles I have read, of the health benefits of wild Alaskan salmon. According to ‘The 150 Healthiest Foods on Earth’ by Jonny Bowen not alone is it an excellent source of high quality protein but it is also one of the best sources of Omega 3’s (they are the good fats that are helpful for heart and brain health) on the planet. On top of that a 3oz serving delivers almost half of the daily recommended dose of selenium and vitamin B12 as well as a fair amounts of potassium and niacin. Oh and it also taste good. I would go so far as to say that a beautifully prepared piece of wild Alaska salmon is one of the loveliest tastes on earth! 🙂 I was lucky to live in Washington for so long, where we could get that fish pretty easily and cheaply, not to mention having had a grandfather who fished local wild salmon for us from time to time in my younger years. Heaven! Oh that sounds great especially having a grandfather who fished local wild salmon for you. Gorgeous… love Dries van Noten. 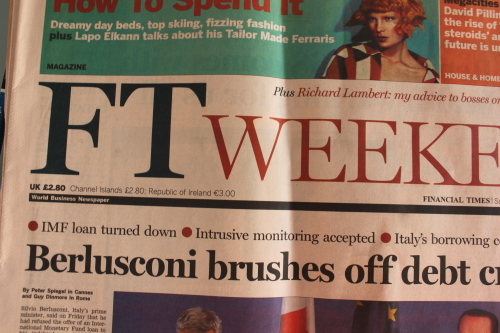 And the FT is brilliant (and cheap) for wrapping xmas presents in after you’ve read it! Best wishes. Thanks Sarah …. I love your idea of wrapping Christmas presents in the FT.